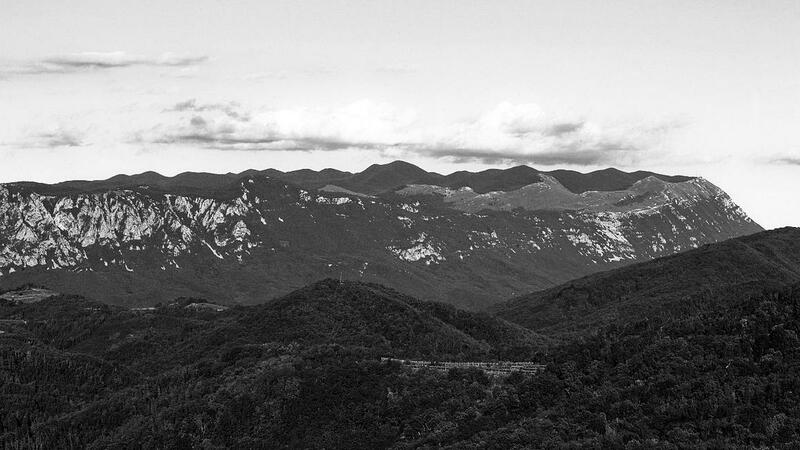 Nanos, a plateau between inland and Mediterranean Slovenia, is influenced by both environments. The result is a rich variety of plant life and unique scenery that enjoys official protection as the Nanos Landscape Park. In the summer, the rocky plateau is scorched by the sun. In other seasons, it is frequently buffeted by strong Bora winds, which sometimes reach hurricane strength. The harsh environment, combined with extensive areas of limestone, has even left an imprint on local rock. Distinctive grooves, a rare karstic phenomenon, can be seen where the elements have eroded the limestone. The plateau’s plant life is the result of both natural and human processes. Over the centuries, extensive forests have been cleared to enable animals to graze on Nanos. The fields now support a wide variety of flora – species typical of both southern Europe and the Alps. Among them are the endemic Marchesetti’s bellflower and the great yellow gentian, which is used in medicine. At higher elevations, the rare Scopoli’s rockcress can be found growing from cracks in rock. The plateau is also known for its extensive variety of butterflies. The church of St. Hieronymus can be found just under Grmada, one of the summits on the plateau. Meanwhile, the ruins of Vipava Castle overlook the town of the same name on the southern slopes of Nanos. The castle as built by the Patriarchs of Aquileia in the 12th century but was abandoned by the 17th century. Both climbing and hiking trails lead visitors to the highest part of the plateau, which provides a spectacular view across much of western Slovenia, and – on clear days – as far away as Venice. The strategic location has made Nanos the site of a major television transmitter, which is now fully digitalized. The transmitter building contains a small museum of analog technology that once provided a TV signal to hundreds of thousands in both Slovenia and Italy. Most visitors to Slovenia merely drive by Nanos on their journey towards the coast, but the Slovenian government, having recognized the area’s unique flora, geology, and history, declared the plateau a Landscape Park in 1987, making it a haven for hikers and nature lovers.